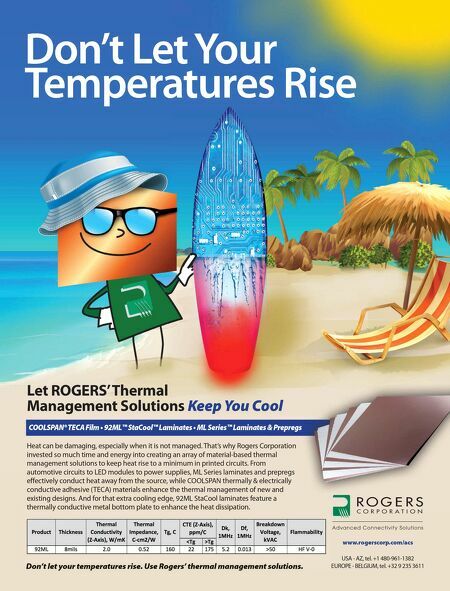 12 The PCB Design Magazine • November 2016 CAT is a provider of market-critical data uti- lized by designers, purchasers, assemblers, and manufacturers of printed circuit boards, and by material and equipment suppliers to the printed circuit industry. Our products and services pro- vide quantitative data on printed circuit manu- facturing capability, quality, and reliability. Results from the analysis of CAT test panel and coupon designs provide quantitative yield, by Andy Shaughnessy Conductor Analysis Technologies (CAT) has been analyzing test panels and coupon designs for over 20 years. CAT's analysis pro- vides valuable, quantitative data on PCB qual- ity and reliability, which can help designers and manufacturers trace the source of defects and non-uniformities. In this e-mail interview, Vice President of Technical Marketing David Wolf discusses some of the trends he's seeing in via structures, and the common reliability and quality issues related to vias. Andy Shaughnessy: David, tell us a little about Conductor Analysis Technologies and your work with the IPC PCQR 2 Database. David Wolf: Conductor Analysis Technolo- gies Inc. is a privately held company founded in May 1994. The company is an offshoot of a National Center for Manufacturing Sciences (NCMS) program called the Imaging Team. The first test coupon design was used for evaluating conductor and space formation process capabil- ity, hence the naming of the company. 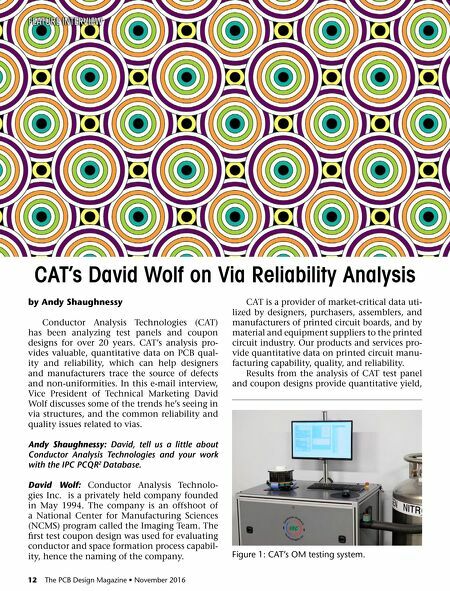 CAT's David Wolf on Via Reliability Analysis FEATURE INTERVIEW Figure 1: CAT's OM testing system. Feature Column — Hey, They're Just Vias—or Are They?